Overview: Cline again does a wonderful job interlacing 70s and 80s pop culture throughout Armada’s, fast paced, edge of your seat journey. Zach, is your stereotypical geeky teenage boy, just weeks from graduating high school, struggling to accept the fear/dread of growing up and what future holds. Within an instant, Zach’s reality, as he knows it, is shattered while simultaneously, delighting conspiracy theorists everywhere. Overall, Armada‘s, story will keep you glued to the book, however the plot twists, for the most part are cheesy and predictable. Warning: Following text could contain spoilers. 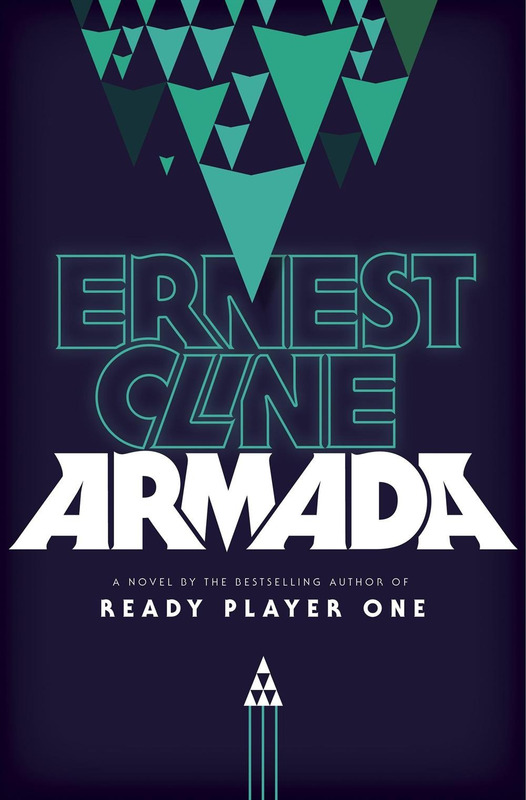 After reading Ready Player One and proceeding to rave about it anyone that would listen, coworkers, friends, and family, needless to say I was excited to get Ernest Cline’s next novel, Armada, when it was released Tuesday. Having been on vacation in the rural, Upper Peninsula of Michigan, it took an hour drive to Marquette to procure the book from a cute little bookstore, which, lucky for me had preordered a few copies. Of course, I spent the next few morning relaxing on Au Train Beach immersed in Cline’s action filled world. I do have a few regrets about reading Ready Player One and Armada back to back due to similar references and writing styles. I found myself getting the stories confused and worry that I have short changed Armada by not allowing a little more distance between to two novels. Armada starts out with a small town boy, Zach, finishing out his last few weeks before high school graduation. He laments various times about the boring, monotony of his hometown, similar to the extent of Ethan Wate in Beautiful Creatures. Zach, for the majority of his life, has been obsessed with video games and his late father. His father, who was killed when Zach was an infant, left behind boxes of his belongings, particularly movies, videogames, and music, all from the 70s and 80s. Specifically, Zach is drawn to the videogame, Armada, which involves humans remote controlling drones while defending earth from alien invaders. One of the interesting features of the Armada video games lies in the fact that the players are penalized significantly for destroying public property, such as homes or infrastructure. This concept has been in the media recently with respect to Zach Snyder’s Man of Steel movie, which has been estimated to have killed approximately 129,000 people. Movies and video games are notorious for large battle scenes in densely populated areas without accounting for actual damage or loss of human life. Armada, factoring in this concept, adds an element of reality and humanity to the videogame by ingraining the player to be cautious and aware of their surroundings. Moving on, imagine Zach’s surprise when he actually sees one of the alien ships outside his school. With the emergence of these shops, I immediately found myself began comparisons to Ender’s Game, especially after Zach plays a one-chance mission attacking the home planet of the aliens. We find out after the fact that the mission was an actual real-life battle that the players did not know they were partaking in which relates back to Ender’s final battle. To be fair, Ender’s Game is referenced several times within the context of Zach’s father’s conspiracy theory. The concept of conspiracy theories is brought up many times throughout Armada with the overarching theme of not believing everything you’re told. Zach found a journal in his late father’s belongings highlighting a theory that the government was training civilians to become soldiers through video games. Also that Star Wars, Star Trek, Ender’s Game, and any other alien based movie, literature, or video game has been subliminally preparing the public for the alien invasion the government has known about since the 70s. The one concept throughout the book I found to be flawed was the concept of civilian straight to soldier. If this fight was truly for mankind why not tell people sooner and have the masses all training like it was their jobs, better yet like their lives depended on their skill level. Also, why are only part of the top 10 taken to the moon base? You’re telling me the top 25 or even the top 50 are not elite players that would be more efficient than computer simulated drones. The drones themselves rang similar to avatars in Ready Player One, whereas a drone could be killed during the battle, however the individual person controlling the drone was alive and well. During the climatic battle scene near Europa when Zach’s drone is destroyed, initially a sense of hopelessness and panic settles into the reader, nevertheless he proceeds to take command of the last drone and finishes the battle. Overall, after the thrill I got out of Ready Player One, Armada fell flat. The characters were all stereotypical and lacked the depth needed to feel real concern toward their well being. While the science fiction references are plentiful, many times I had to stop to look up a specific details to fully understand the context of the reference. Armada lies on the border of fan fiction, with Cline taking Ender’s Game, Star Wars, Star Trek, amongst others and blending them all together. Every exchange between Lexi and Zach caused a physical sigh and reflex eye roll. So cheesy. Did anyone else find correlation between Zach’s Father and Darth Vader? Both characters are presumed dead by their sons who are stuck in boring, runoff the mill towns/planets. The sons’ find out their destiny includes more than they possible could have imagined, along with their fathers still being alive and well, both of which holding high offices of power. The group of elite recruits, after finding out less than 24 hours ago that aliens not only exist but are attacking earth and upon arriving at the moonbase to only have an hour before the imminent attack everyone sneaks off to hook up with each other. So cheesy. Realistically they would be running diagnostic tests, simulations, or other various activities to prep themselves for the upcoming battle. Zach’s mental stability is addressed several times, especially in context of managing his anger. As many times as his ‘issue’ was referenced I was expecting some large event to happen in the book with either this anger problem at the root or solving a crucial problem. The thought had even crossed my mind that they were secretly dosing him with some experimental serum to improve his gaming capabilities, however had anger side effects. I still don’t understand Zach’s father’s sacrifice. I feel like he did not need to destroy himself to cause the delay. The delay was already successful when he’d reached the main room. If he had wanted to make an impact shouldn’t he have detonated himself within the vicinity of the Admiral and his cohorts so they could not launch the icebreaker. Why waste his life when he had finally reunited with his wife and son? I’m a crier and this sequence didn’t even pull a tear, in which usually I would be a slobbering mess especially during such an Armageddon type death (poor Bruce Willis).